Reminder of our New York City trips. We usually grab one of these at the airport. Update: For a recent BBQ, we used brioche buns, bought the special sauce, used cheddar cheese, and added carmelized onions. Make Shack Sauce by combing all ingredients in a small mixing bowl and stir until well combined. Sauce will keep, covered, in the refrigerator for up to one week. Heat a cast-iron griddle over medium-low heat until warm. Meanwhile, open the hamburger buns and brush the insides with the melted butter. A soft brush is helpful here. Place the buns buttered side down on the griddle and toast until golden brown, 2 to 3 minutes. Transfer buns to a plate. Spoon the sauce onto the top bun. Add a piece of the lettuce and two slices of tomato. Increase the heat to medium and heat the griddle until hot, 2 to 3 minutes. Evenly sprinkle a pinch of salt and pepper on top of each puck of meat. Place the pucks on the griddle, seasoned side down. Using a large, sturdy metal spatula, firmly smash each puck into a 1/3-inch-thick round patty. Pressing down on the spatula with another stiff spatula helps flatten the burger quickly. Evenly sprinkle another big pinch of salt and pepper onto the burgers. Cook the burgers, resisting the urge to move them, until the edges beneath are brown and crisp, and juices on the surface are bubbling hot, about 2 1/2 minutes. Slide one of the spatulas beneath the burger to release it from the griddle and scrape up the caramelized browned crust. Use the other spatula to steady the burger and keep it from sliding. Flip the burgers. 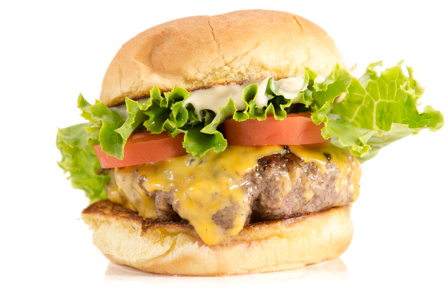 Put the cheese on top and cook the burgers 1 minute longer for medium. Cook more or less depending on your preference. Transfer the cheeseburgers to the prepared buns and enjoy.